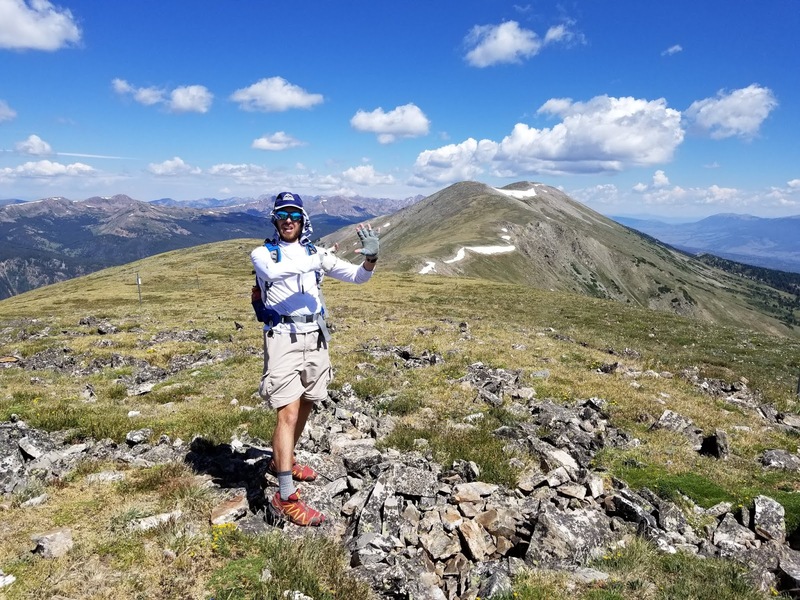 Our splits help tell the story of the challenges of the Tenmile. You can see how the technical terrain from 2 to 3 and from 3 to 4 really slowed things up. 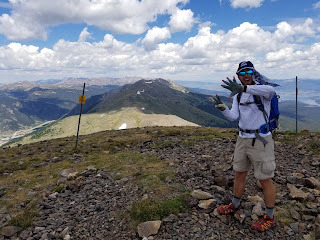 The timing from Peak 5 to 6 was merely about the distance. From 6 to 7, as well as 8 to 9 and 9 to 10 the timing was all about the 800+ foot climbs (and with Peak 10, our haste to beat the weather). The Tenmile Traverse had been slowly crawling its way up my to-do list in recent years of endurance adventures that had to be attempted. 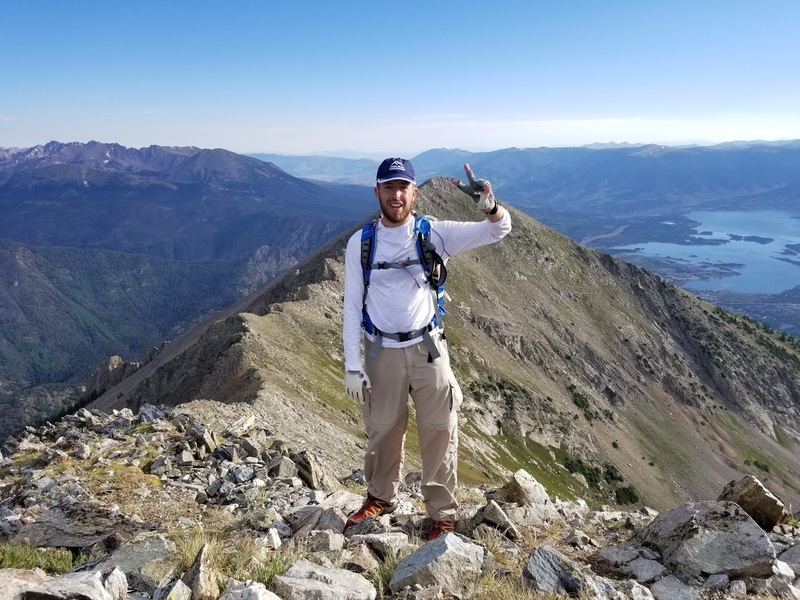 Ever since my father, brother and I had finished the Colorado 14ers I've been more and more into endurance events that test the will and challenge the mind and body. When I'm home in Michigan I've fed this hunger with trail-running and training for marathons, and in 2018, my first ultra marathon. In 2016 David and I did the Grand Canyon R3 which was absolutely epic. In 2017 I did the western half of the Zion Traverse, via backpacking, with a pair of friends and that too really hit the spot. With David onboard this summer, and the timing working out, we decided to finally give this a go. There are a number of good trip reports available on the internet to get an idea of what the route will be like. We didn't find any sort of full length descriptions that really dived into all of the difficulties. We knew there were difficult class 3-4 challenges present from Peaks 2 to 4, and we knew the whole scope of this hike was also a great endurance challenge. It had us excited to say the least. When it came to preparation, the biggest logistical hurdle was handling the shuttling of transportation. 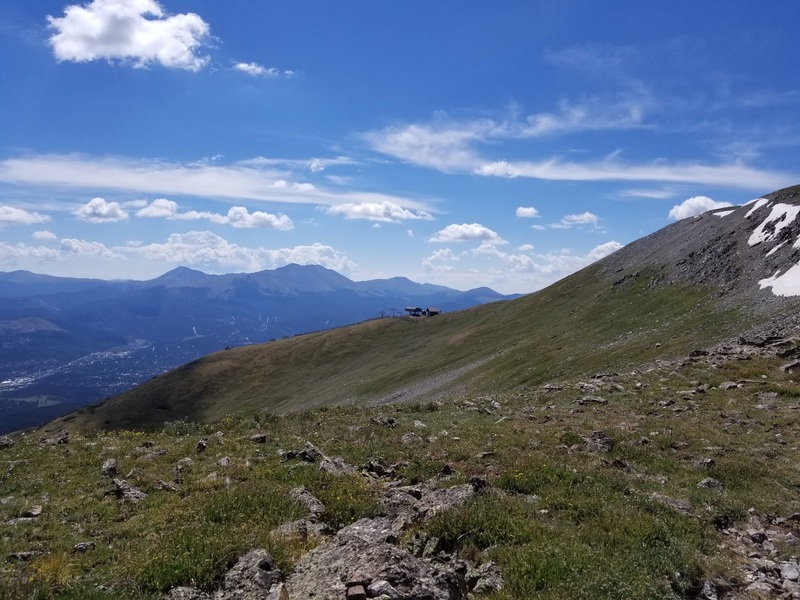 Many will try to hike all the way down into Breckenridge at the end of this to catch one of the public shuttles back to Frisco. We decided to rely on the graciousness of our nearby family, and have them in Breck to pick us up at the end. Even better, our father was going to make the drive up into the ski resort to the Overlook Restaurant to shave a couple miles off for us. We'd read of others pulling off this trick so we didn't feel as though we were cheating the overall adventure. With travel plans in place all we had to do was make the drive to Frisco. When it came to gear, we kept things very simple. 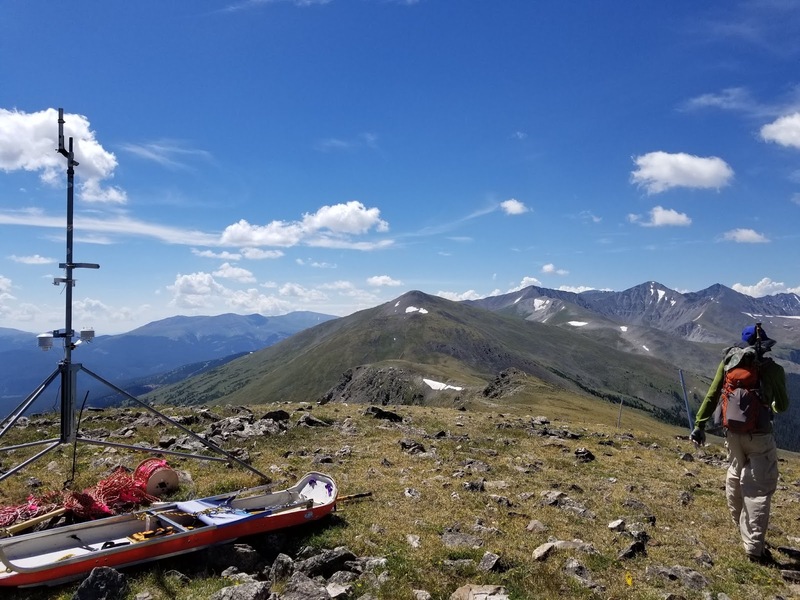 We tried to bring plenty of food and each carried four quarts of water, knowing we wouldn't have access to any water along the way. We did each carry a trekking pole to assist with all the ups and downs. The big question was whether to bring helmets. 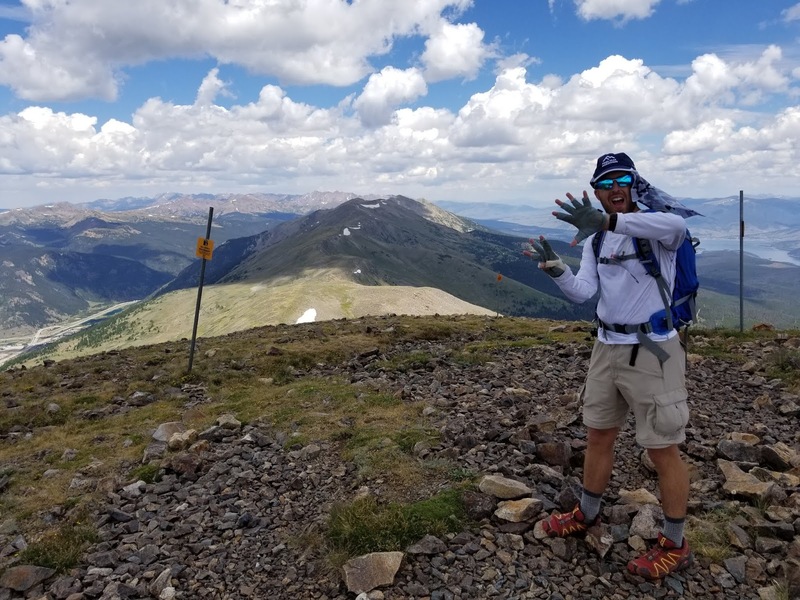 On one hand we wanted to save the weight and dreaded the thought of carrying them on all the ups and downs from Peak 4 onward. On the other hand we had a pretty good feeling they were a good idea from Peaks 2 to 4. Well the verdict was we decided not to bring them. However, we certainly felt from Peak 2 onward through the technical terrain that it really would have been a good idea for safety sake. It certainly wouldn't be our advice to leave the helmet at home and we would probably carry if we did this again. Our day began with the drive to Frisco and then parking in the trailhead lot for Mt. Royal. Google Maps lists this also as the Rainbow Lake Trailhead. We started with jackets and headlamps. We walked down the bike path to the Mt. Royal trail and began our way up hill. We were probably 20 minutes in when we took the jackets off. It was about 50 degrees out. 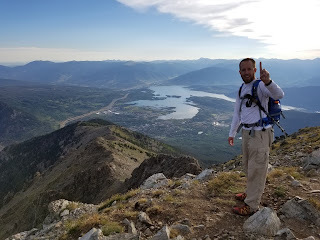 We made a modest pace up to the junction for either the Royal summit or to continue on to Victoria and Peak 1. We avoided Royal and continued upwards. 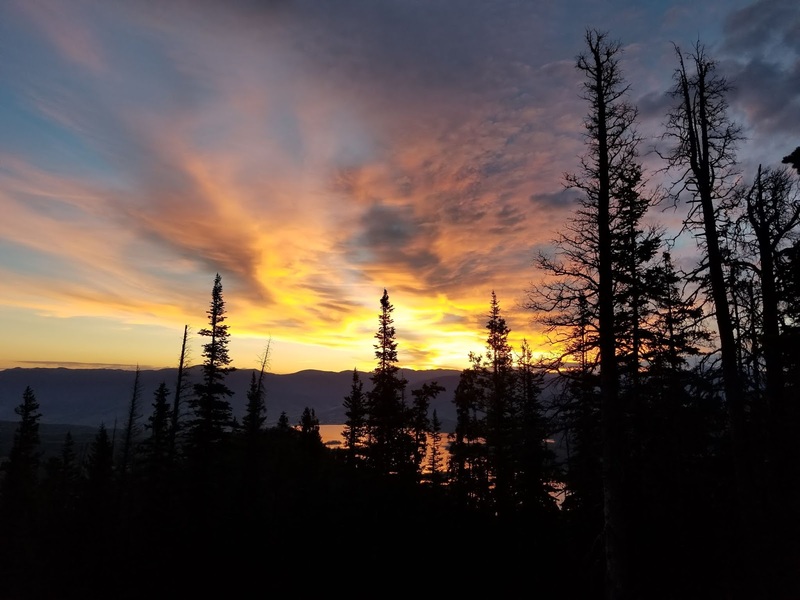 The trail on to Victoria started to offer some wonderful views of the sunrise over Frisco and Dillon Reservoir. It was also very steep in parts working its way up the hillside. When it finally started to flatten out a bit near treeline we took a little break. The trail continued to gain but at a slightly easier clip as we made our way up to Victoria. 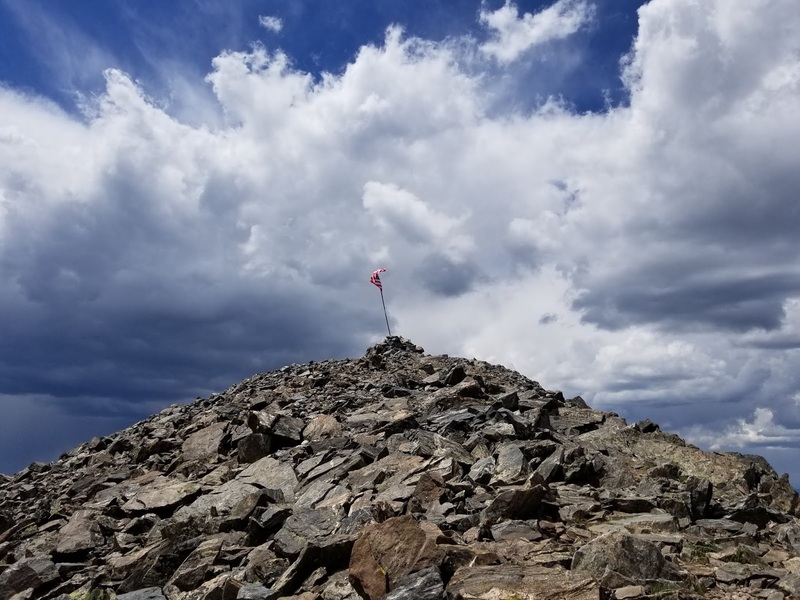 We strolled over its summit and continued onward. We were curious if the trail would disappear at some point in the climb. We had a moment where we thought it had. 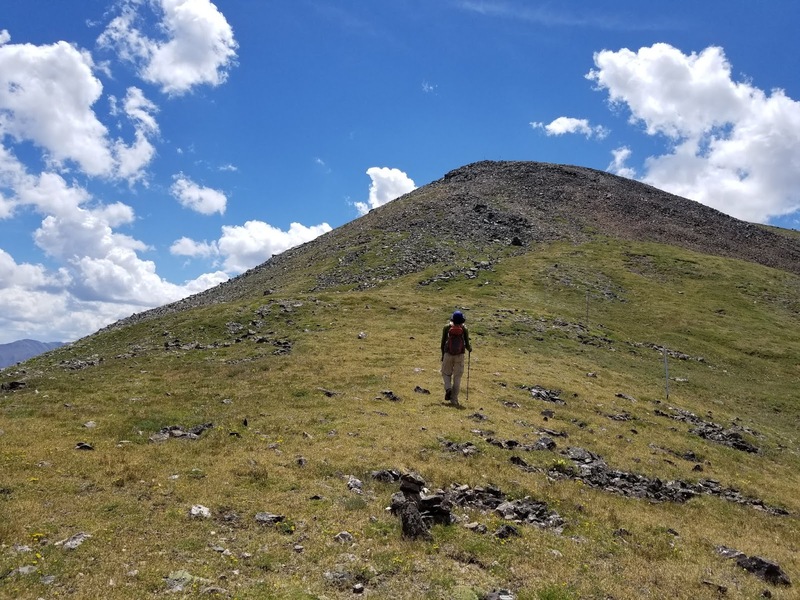 We reached a cairn at the bottom of a talus slope and saw another cairn up in the talus. It looked like the trail would fade out here. We followed the best route we could through the talus and above it found a good trail began once more. 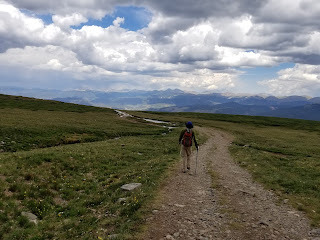 As a note, from Peak 1 onward there really wasn't any trail except when we met up with the Colorado Trail. 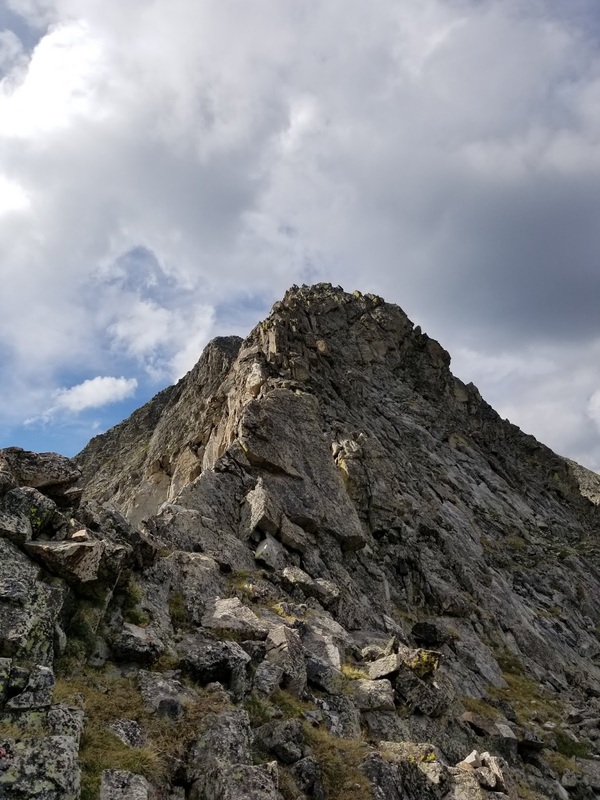 The only real scrambling difficulty on Peak 1's approach came just over 12,500. When you approach the peak you see cliffy terrain on the east side of the approach ridge. This is illustrated in the following picture. 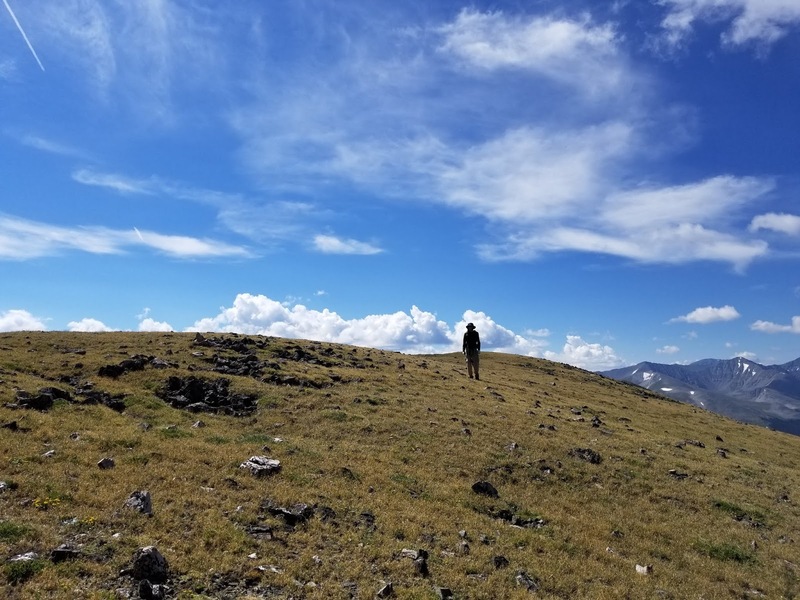 At a distance you wonder if there is even a possible route to gain the summit. As you get nearer you see a rock slope and more manageable terrain. 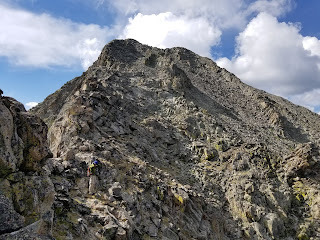 We found a good route to bypass the cliffs and climbed what I would call class 2+ to the summit. In a way, this would set the tone for the day. From Peaks 1 to 4 you would frequently see terrain ahead of you and wonder how in the world it is going to work out. Yet, as you get closer the solutions would always present themselves. Frequent climbers will note this is usually the case on most peaks. 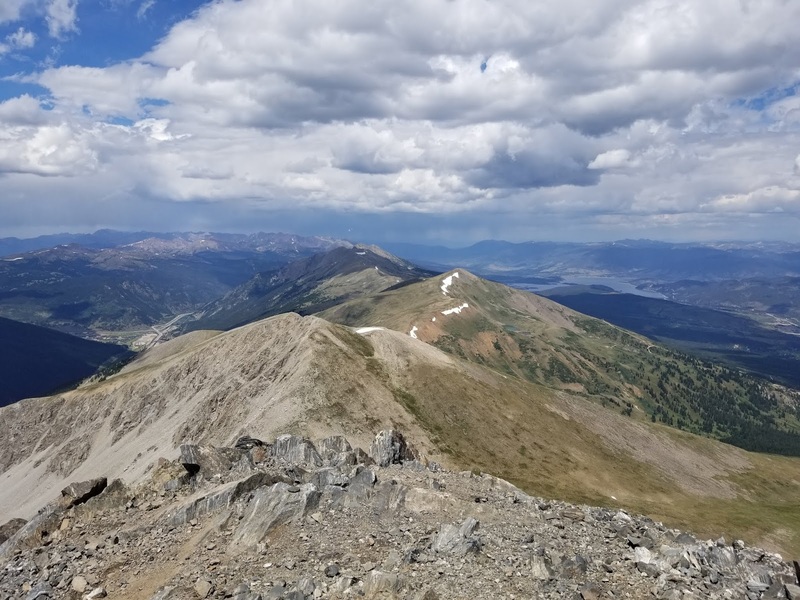 The summit of Peak 1 offered rewarding views back to Frisco and the Dillon Reservoir. It was also refreshing to get up that first big climb of the day and to know what remained wasn't quite so bad. 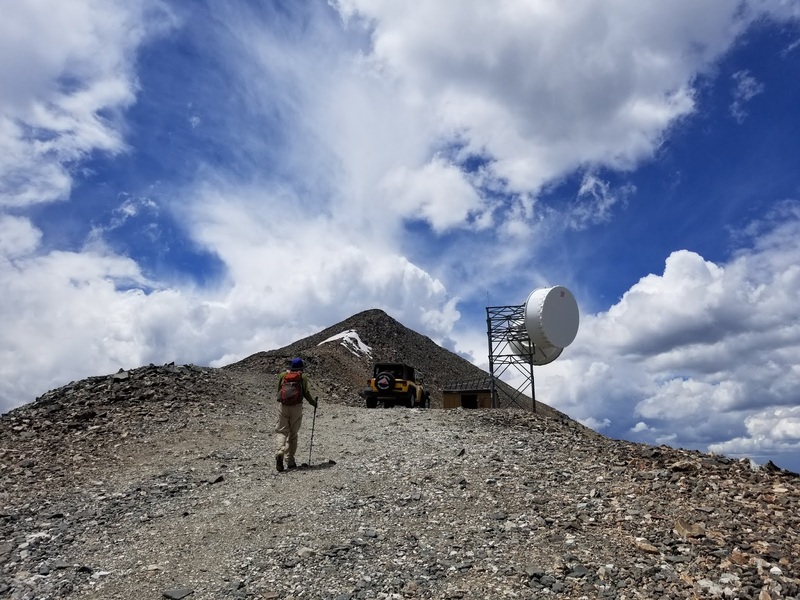 From reports we had read up to this point we knew well that from Peak 1 on to Peak 4 (in particular 2 to 4) were the technical portions of this activity. 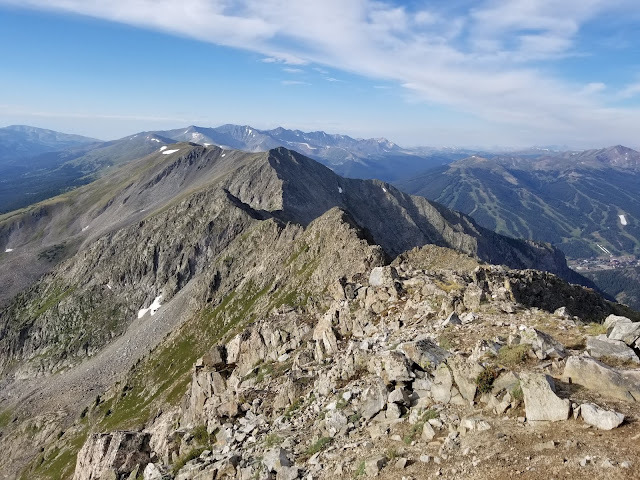 This is why most individuals doing the Tenmile Traverse go from north to south in order to get the more technical stuff out of the way with fresher legs. At this point, we could say so far so good. 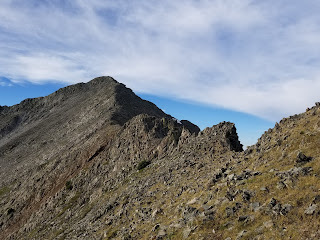 The above photo shows the connecting ridge between Peaks 1 and 2. The descent off Peak 1 could be described as an easy class 2 descent picking your way through the rock, making your own path, but no real scrambling difficulty. The above photo illustrates the one jagged area about halfway between Peaks 1 and 2. It proved to be a nice warmup to the even greater difficulties after Peak 2. I wouldn't say anything in it necessarily hits class 3 yet, but it did force us to do a bit of routefinding and perhaps use hand on rock a few times to maneuver. The above photo shows more a closeup into the more difficult area between Peaks 1 and 2. 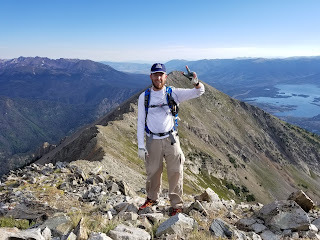 On the summit of Peak 2. Only 8 more to go. The above photo is the view from Peak 2 towards Peaks 3 and 4. Peak 3 is the smaller peak with a dark horizontal shadow directly on its right. From here it looks more like a bump on the ridge. Peak 4 is the larger half shadowed peak just above center. The initial descent from Peak 2 was much like that from Peak 1, fairly straightforward, no clear trail, but easy rock and small bits of grass to work with on an obvious descent. 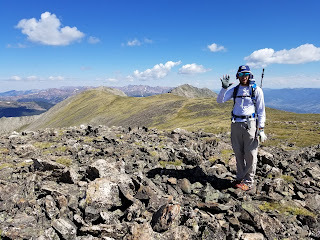 Viewing the Dragon's Back from Peak 2. Lots of solid rock, but very exposed and jagged. 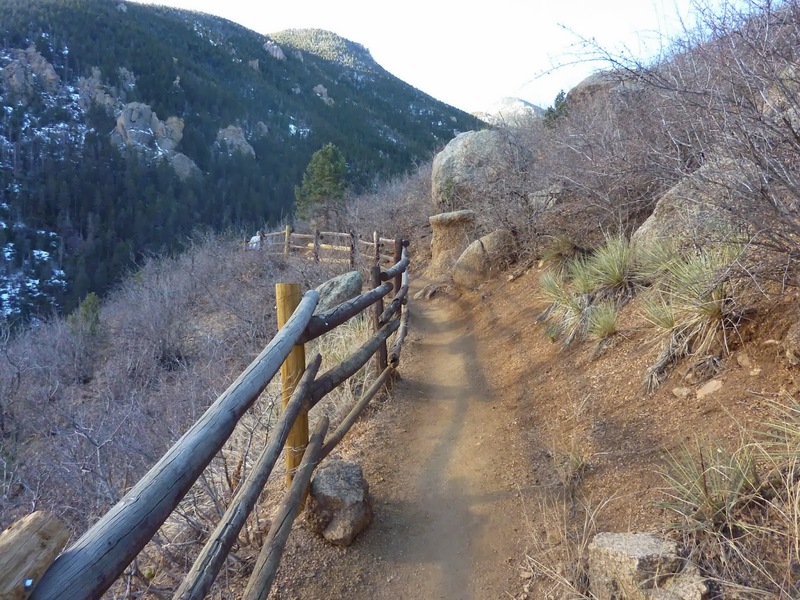 The above photo illustrates the first obstacle after Peak 2. You'll find yourself in an ever increasingly steep descent that eventually looks like it cliffs out. You'll then see a low gap that separates you from this rock tower in front of you. My brother and I spent a few minutes scouting out the descent to get down into the gap at the base of this tower. We did find a reasonable class 3 route (in fact I think there are a handful of options here) to descend without too much exposure. The above photo shows the terrain from the base of the aforementioned rock tower. There is a rock/grass gully that descends down and around the tower giving easier passage forward. The above photo is the classic shot of the Dragon's Back. You can see my brother standing in the gap near what I believe is the "tail" of the Dragon. You'll want to head to that spot. As we approach we had never heard with certainty whether one should climb up and over the dragon (we had seen pics of this) or whether there was a bypass for the non class 5 climbers in the bunch. I was saying a few small prayers here hoping the bypass was for real. My brother standing in the above gap assured me there was indeed a way around if you don't have the "big cojones" to climb on top the Dragon. The above photo shows what the bypass looks like. 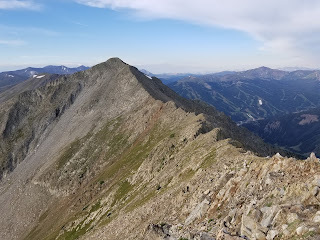 Its a fairly steep loose scree rock descent of about 150 feet down and around that ends in a class 2+ scramble on loose rock back up towards the ridge line. If you're just not into extreme exposure and class 5 moves on such rock then this will be your path. The above photo is another take on what the bypass looks like from above. You're also seeing Peak 3 (the rounded hump almost obscured towards left of center) and Peak 4 (the more obvious peak right of center). The ascent back to the ridge after the bypass can mostly be seen as well as a bit of the scrambling after this ascent. We would suggest eyeing your route very carefully when getting back to the ridge from the bypass around the Dragon's Back. 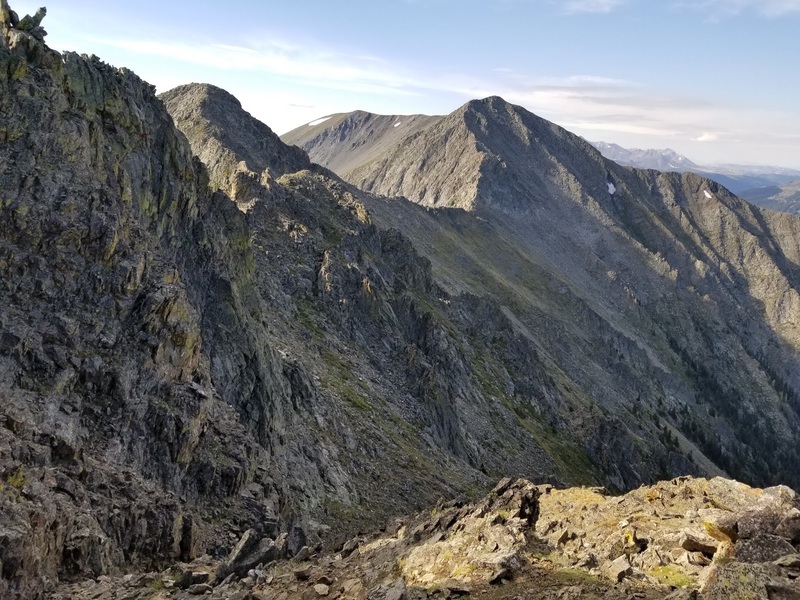 We picked a direct route that got us into some more difficult scrambling (class 3) and later saw we had missed a cairn that stays lower at the end of the bypass and gains the ridge just a bit later on easier terrain. 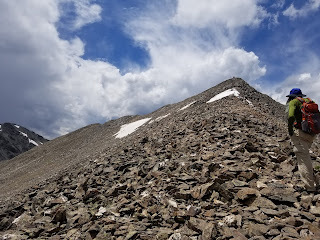 On the plus side, once you've navigated these difficulties the ascent up to Peak 3 was fairly easy on a modest talus slope with no real technical difficulty. The above photo shows the connecting ridge from Peak 3 to 4. The descent off three was fairly straightforward and takes you down to the low point seen just below center in the photo. 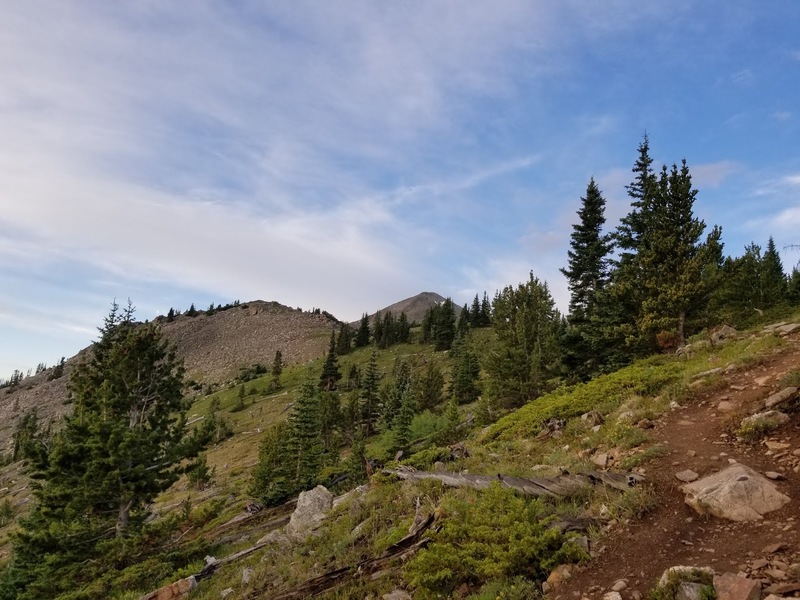 The latter half of the ascent up to Peak 4 is where you'll encounter your last real technical difficulties on the Tenmile. Many other folks have described this area as the most fun rock of the day. My brother and I are still digesting whether that was true. The above photo shows a bit of the scrambling around where the big hump in the ridge was in the previous photo. Just above this scrambling is where the real difficulties begin. 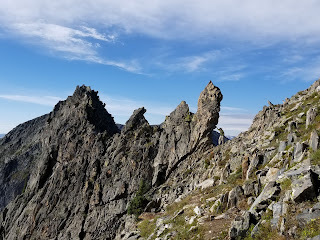 The above photo shows the crux area on the way to Peak 4. You can see the small knife edge to the left of center and then the steep, exposed rock above it. The knife edge itself wasn't overly difficult but picking your route after was the real challenge. I would imagine some folks will go ridge direct on the solid but exposed rock just above the knife. We opted for a route on the ledges that head to the climber's right. The above photo takes a closer look into the difficulties here. I am just above the knife edge now and scrambling onto some rock which would provide a safe, momentary perch. The ridge direct would go climber's left above me, our exposed ledge route would go climber's route. When you're in this area in person the ledge route becomes evident to most eyes. The above photo shows my brother straddling the knife edge. Having done Capitol in 2015 we had gone through months of mentally preparing (and fretting) what a knife edge would be like. Capitol's was longer and with even more exposure. This was fairly short, and while exposed, it didn't have the sheer drops of Capitol. There were also more hand and foot holds to be used here. Funny story took place in these moments. I typically carry my Smartphone (a big Galaxy Note 8) in my right pocket. It makes for quick access for pictures and GPS access. When I prepared to hop on the knife edge I didn't want to risk the possible of awkward positions and rock straddling pushing that phone out to its untimely demise. So I took the phone from my pocket and put it into a zippered pocket in my pant legs. This went well until I was above the knife edge and my brother straddled into the middle and wanted the picture that was taken above. I went to get my phone out and the zipper was stuck. I jiggled and jiggled and it wasn't moving. I also knew I didn't have my pocketknife on me to just cut it open. Here my brother is waiting in the middle of an exposed knife edge straddling rock between his legs and I'm making him wait. I started to tell him "Dude, its not happening, it's not worth it, just move on" but he really wanted the photo. Finally after 3-4 minutes of desperately pulling on the zipper I got it to move and my phone was freed for the photo. The above photo is a look from halfway through the exposed ledge area. It didn't provide a lot of room for the feed but there were just enough handholds to get us through. Once above the exposed ledges we found this to be the remaining terrain up to Peak 4. I would characterize it as easy scrambling. 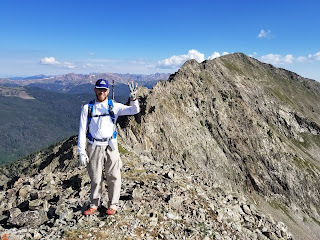 Looking back now at both Peak 3 (smaller) and Peak 2. The above photo was an attempt to capture one of the most delightful moments of the Tenmile Traverse. After over 2 hours of difficult rock scrambling and climbing and moments that would almost fray the nerves, not to mention the 3800 foot climb to get up there, you look forward and you see the heavenly grassy slopes leading onward. It is jaw-dropping the abrupt change in terrain that happens after the top of Peak 4. At the tip of my brother's hand is Peak 10. We still have a bit of a long ways to go here. The hike from Peak 4 to Peak 5 was just under a half mile and it was almost entirely flat. 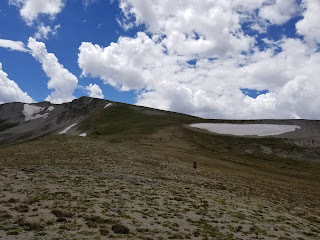 I jokingly told my brother this was such a delight to be on the fluffy tundra grass that we could hop along and prance like antelope the rest of the way. 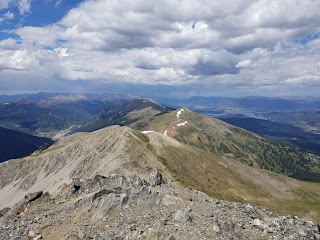 It barely took us 15 minutes to be on top of Peak 5. It's worth noting, many others have commented how Peak 5 is hardly a Peak but more of just a tiny bump on the ridge and this is a very fair take. 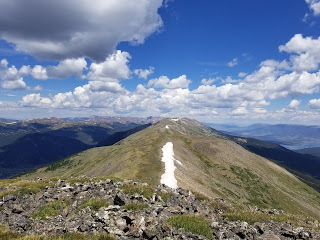 The above photo shows most of the remaining Tenmile from Peak 5. 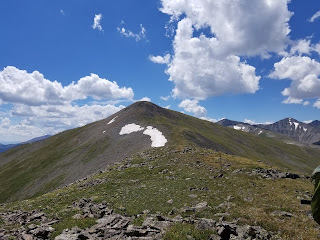 Peak 6 happens to be the lowest of the 10 Peaks and is the small bump ahead in this photo with the snow lining the left side of the ridge. The slightly higher bump above it with a small snow patch is Peak 7. You'll know Peak 6 as it is the first Peak with a ski lift on the side of it. The highlight of the easy, but somewhat lengthy (about 1.6 miles) stretch between Peaks 5 and 6 is the Colorado Trail (also Continental Divide Trail) meets up for about a half mile in here. It's also about the only half mile of real trail you'll find out here. 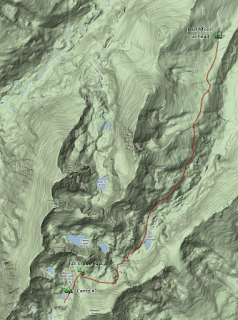 We'd heard reports from others who had encountered a handful of through hikers in this stretch. 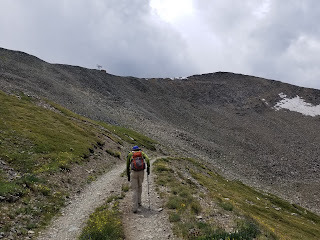 When we gained the CT we saw a man behind us coming up from the Gold Hill (Breck) side with a backpack but he wasn't close enough to stop for conversation. It was also just before this stretch that a pair of ultrarunners had sped by us like mountain goats. They were the only other individuals we encountered doing the Tenmile this day and they moved really well. Great job guys! From Peak 6 onward to almost Peak 9 you'll frequently encounter signs relating to the Breck Ski Resort warning of boundaries and the like. At first we worried these were no trespassing signs but that really wasn't the case. These signs seemed more intended for winter use to keep skiers within bounds. We did encounter several instances of winter mountain/ski rescue gear near the tops of the summits and would strongly encourage all other hikers to leave the Breck Ski resort gear alone, as we had done. 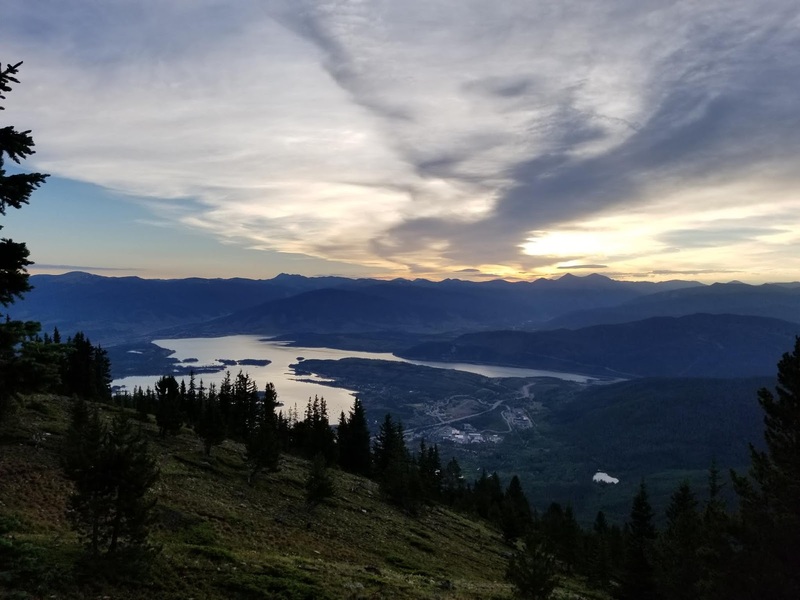 It's just the right thing to do and not risk fracturing a relationship where the ski resorts might hamper access to this part of the Tenmile. 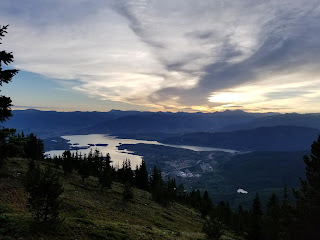 It's worth mentioning at some point the discussion of bail outs on the Tenmile. Today we were armed with a decent, though far from perfect weather report. Around 11am we faced an increasing risk of showers and storms. We spent time discussing the options of what we would do if things got bad in a hurry. Our primary goals were to get past Peak 4 in a good amount of time to get past the technical difficulties. That is essential not to face that area in bad weather. Our next goal was to gain Peak 6 as the ski area would offer reasonable slopes to descend if the weather went bad. That became the most obvious bail out choice. 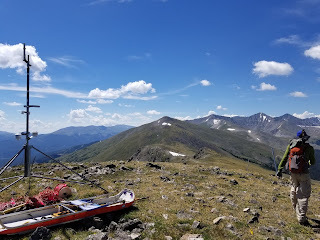 The above photo shows a bit of the ski resort gear (and a weather station?) atop Peak 6 with our remaining objectives ahead. Peak 7 proves to be like Peak 5 in that it is a small almost insignificant bump in the ridge before Peak. In the above photo Peak 7 is just below the snow patch at the center of the photo. Peak 8 the more notable peak above it. Peak 10 is the notable peak to the right and behind Peak 8 with Peak 9 a small bump in front of 10. Finally, the end was in sight. We were also noting the weather at this point. When we stood on Peak 6 it was right around 11am, we had hit our goal in that respect. Whatever happened from here on out we felt we had bailing options. But if you see the skies in our photos things looked wonderful. We were truly thankful the weather was holding admirably up to this point. The hike over to Peak 7 provides the first real big drop in elevation of the day, and then with it, the first big climb since that up to Peak 1. This drop also takes you to the low point of the Tenmile at near 12,100. If you do the math, you'll note this means an almost 600 foot climb to Peak 7 with another 300 feet to gain Peak 8. And from 12,100 you're 1500 feet below Peak 10. Losing the elevation here is a bit of a downer. The above photo was taken from the low point with the grunt of a grassy climb up to Peak 7 ahead. It was fairly steep and forced us into working small switchbacks. The above photo shows the work of the Breck Ski area to put up a wind barrier to help with snow loading during the ski season. We ascended the grassy slope to the right of the fencing. This is a rare case where the actual was slightly steeper than the picture shows. It was tough work. The above photo shows the very short work needed to get over to Peak 8. Our splits show it only took 16 minutes and part of that was 3-4 minutes on top of 7 taking some photos. 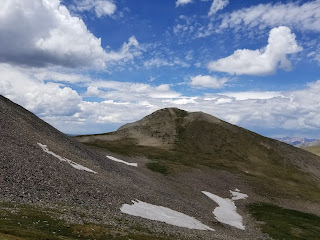 The above photo shows the mild terrain on the final stretch up to Peak 8. A look back at Peaks 7 and under with an up-to-this-point wonderfully beautiful day unfolding. 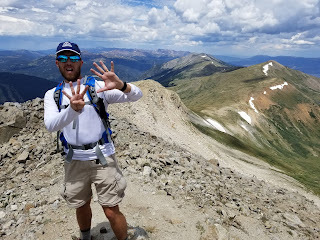 The hike over to Peak 9 provided the most challenge we had faced since we left Peak 4. Upon leaving Peak 8 we faced a steady descent of about 600 feet to another low grassy saddle around 12,400. 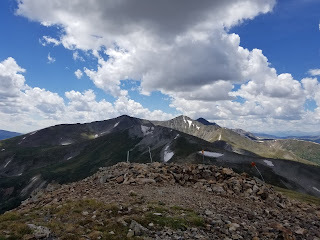 From here we could see the full 800 feet of climbing to get back up to Peak 9. It was also in this low point we could see the weather starting to get more questionable. This added a growing sense of urgency to keep moving for us. The above photo shows what I would call a flattened look at the ascent over to Peak 9. 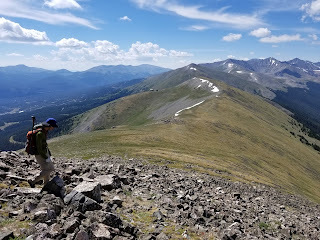 We ascended the steep grassy slopes in the middle of the photo which proved to be quite a workout with no trail and just the grunt of the climb. Most of this climb was at about a 33% grade, not easy work. At the top of the climb you gain the north ridge of Peak 9 and continue to gain for a bit. 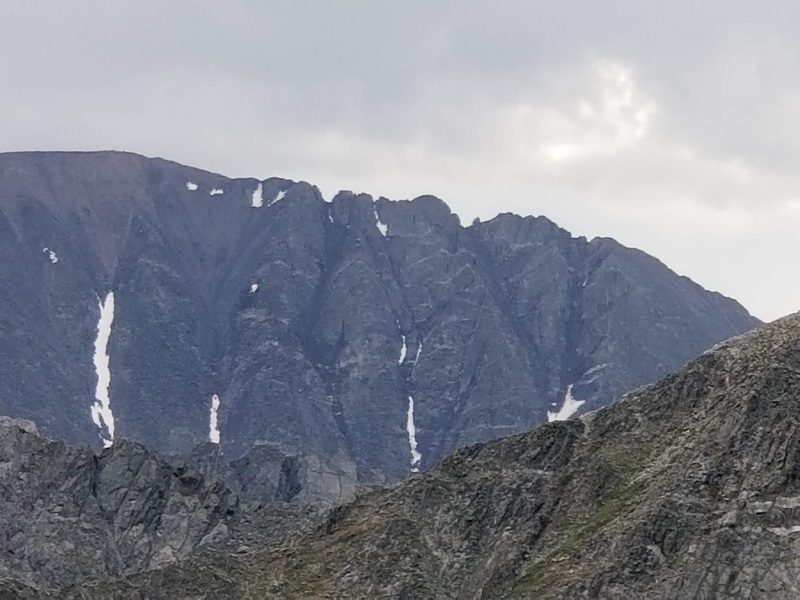 The seemingly taller peak in the above photo you bypass on its west side and find it is not actually the summit. The point to the far left in the above photo is actually Peak 9. 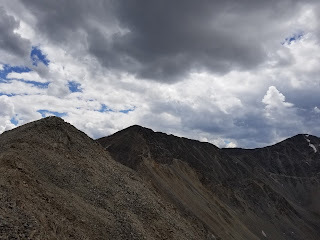 As we neared Peak 9's summit the clouds were looking less and less appealing. In the above photo Peak 9 is the peak on the far left with Peak 10 behind it in center. On the plus side we knew we didn't have far to go. 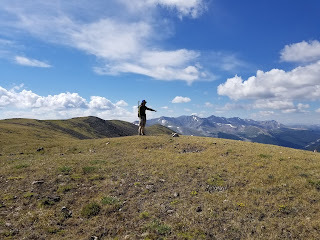 As we approached the summit of Peak 9 we debated our strategy. Some of it would involve the choice of approach to Peak 10. 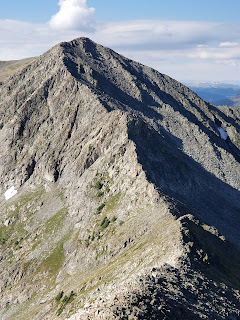 Some folks will take the direct ascent of Peak 10 scrambling up its very steep talus slope on the north side. Others will hike over to the road and take the road up to the summit. We were opting road thinking, though it was longer, it would prove to be easier on effort. This would also factor into our weather options. Our plan became we'd hike to the road knowing we would have to go that way anyways and then we'd hike up to the road watching the weather. We could then turnaround and head down at any moment. 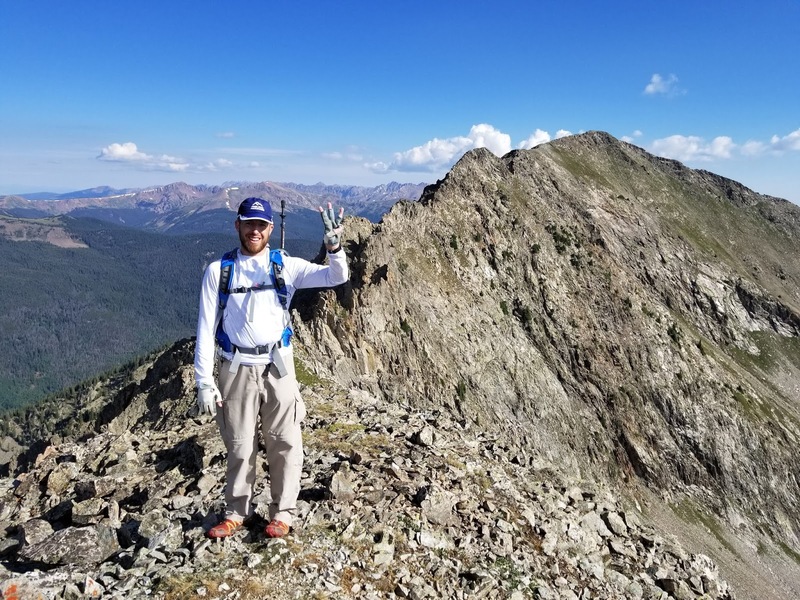 The above photo shows one last surprise on the summit ridge of Peak 9. This is actually looking backwards from the ascent route to a brief downclimb of what I would call 2 or 3 class 3 moves. The exposure was minimal but the moves were enough for me to stow my trekking pole for a moment to free up my hands and not let tired legs lead me into a mistake. The above photo is my brother David on the summit of Peak 9. This was our only good shot of Peak 10 from Peak 9. The road ascends from the left side of what this photo shows. The direct route would go straight up the middle of this photo. 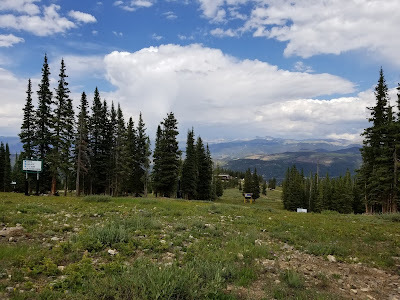 The above photo is looking back at Peak 9. The descent from 9 was also very steep and in very steep tundra with small rock mixed in. We had really sped up the pace in here because of the weather and started to push on to physical and cardio limits. When the terrain mellows out as the picture shows we worked through a small boulder field to make a bee-line towards the road. 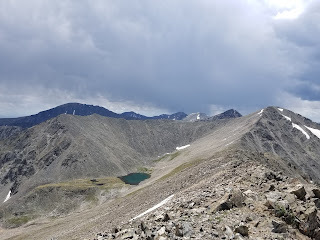 This photo is taken from where we gained the road up to Peak 10. For the most part we just made a visual bee-line to get to the road with nothing special to note. The above photo was taken from the east ridge of Peak 10. 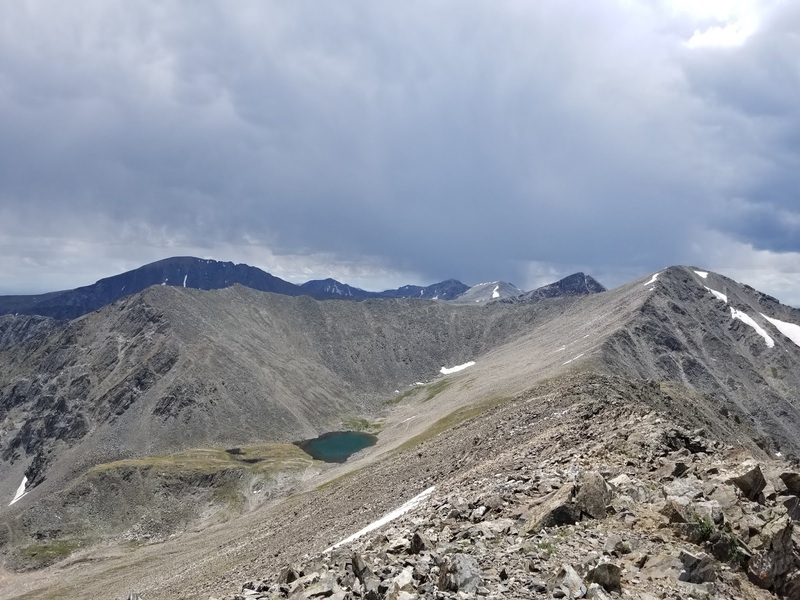 It is of Quandary Peak's West Ridge. We had been up there three days prior. The two jagged drops in the West Ridge are the crux points of the climb on this side of Quandary. 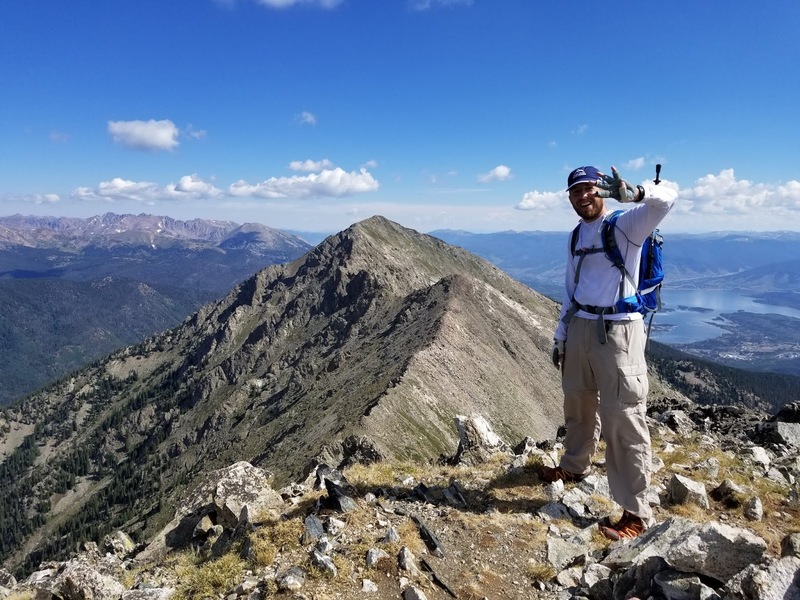 We had a great time on that hike and it provided a handful of moments of real challenging climbing. 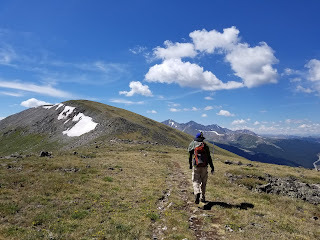 Walking up the 4WD road to Peak 10. Faintly on the ridge you can see the weather station where the road ends leaving with a brief talus scramble to the summit. What is of particular note in this picture is the clouds. I was fairly certain I had seen a small bit of lightning far off to the south over near Quandary and Atlantic. It wasn't looking great here either. We were at best thinking 50/50 on a summit at this point. I was all but ready to call it because of the deteriorating weather. 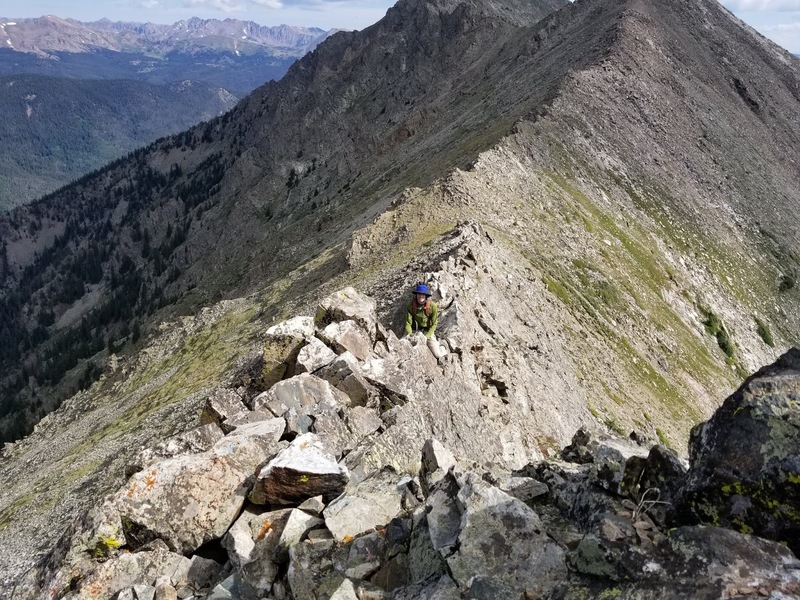 We decided to get to the ridgeline and then make the final call before pushing on the exposed ridge for the summit. This above photo and the next tell the other half of the Peak 10 story for us. In a matter of minutes a window into the clouds opened and the sun began shining on the summit. You almost had to be there to believe it. 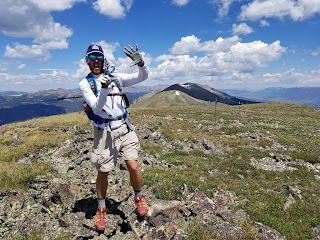 We felt this may well have been another sign of prayers answered that a brief weather window provided us a clear and safe shot to finish the Tenmile. We kept up the pace to take advantage of it. You can see in the above shot a yellow 4WD jeep which two couples had rented and driven up here. The two ladies in the car offered us a ride down the mountain if we wanted it. We said we wanted/needed to do the hike out. We met their husbands on the upper approach to the summit, beyond where the road ends. 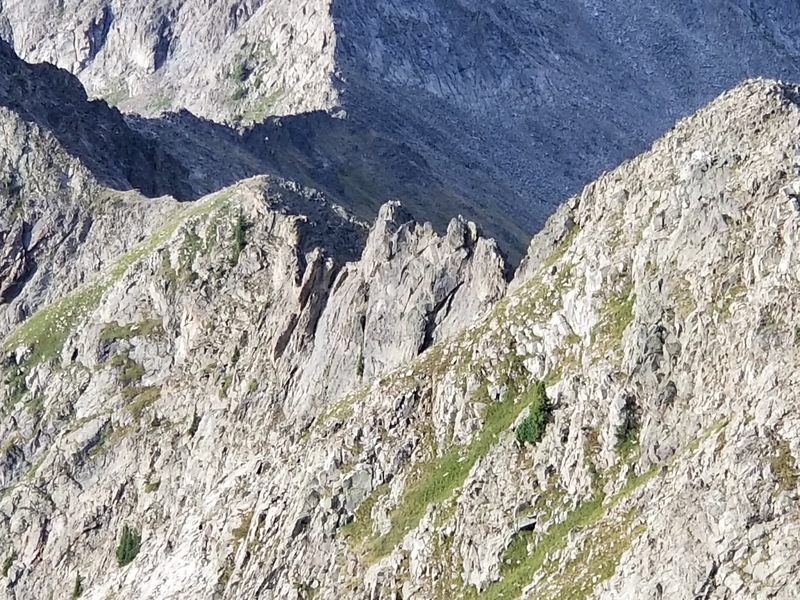 The above photo shows the final approach to Peak 10. 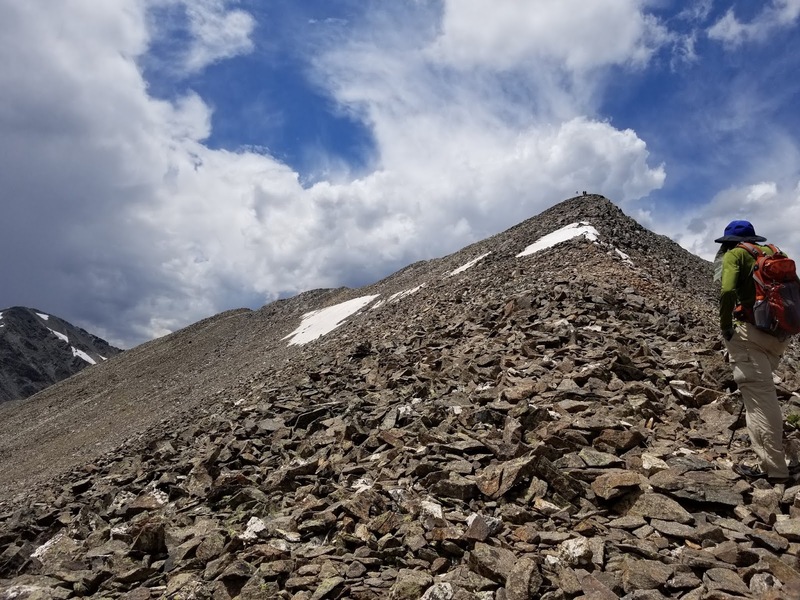 There was one snow patch which a report of two weeks prior described as providing one last obstacle, though not extreme, to the summit. Today we found the patch could be avoided if desired. 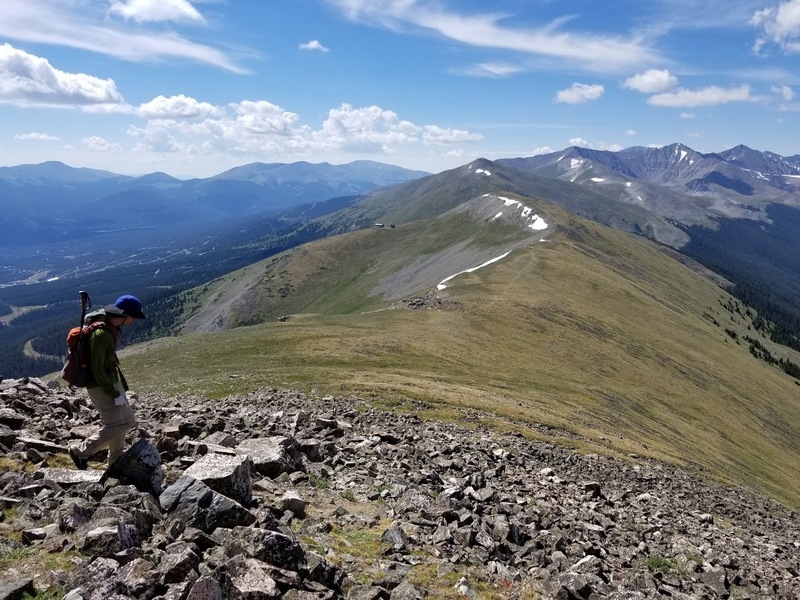 There was some semblance of a path through the rocks that we followed to make our final summit of the day with much jubilation and excitement. A fitting way to cap off an absolutely epic day. 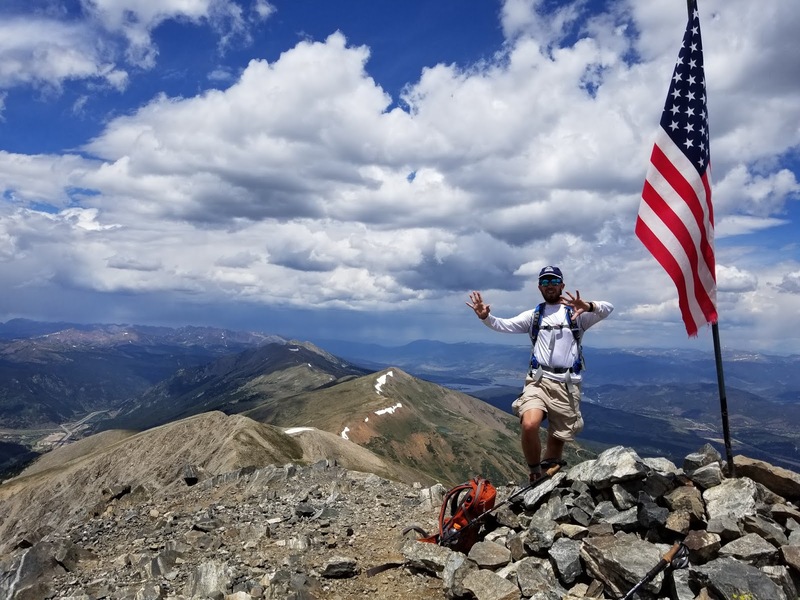 Old Glory on the summit to meet us. 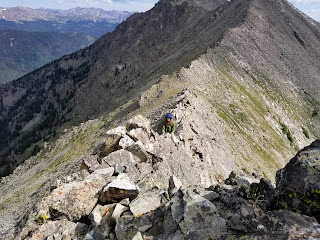 Summit shot of myself on Peak 10 with a weather window holding for us. To the south, the weather would not hold on for long. The nearest peak along the connecting ridge from Peak 10 was Crystal Peak. We felt with better weather and updated plans for pickup we could have made the push further on to gain it. From the summit of Peak 10 you can see the upper switchbacks of the 4WD road. This would be our descent route. It was nice to turn off the route-finding portion of the mind and just settle into an easy pace on the road to follow it down into the ski resort. The weather would quickly begin to deterioriate again. As we descended the road we had a few moments where we could feel sprinkles coming down but it didn't amount to much for us. Above us it appeared the summit area may have taken on more rain. The descent of the road was fairly uneventful. The one fun thing of note is that around Peak 4, about 10am today, I had message with my father offering the guess of a 3pm pickup. I had done a quick bit of math and guessing in my head thinking that might work out. We were finishing up on Peak 10 and descending just before 2pm. We quickly realize that the 3pm pickup might just hit the nail on the head. It did help that for almost the entire hike today we were in cell signal and able to offer updates on progress to those family members concerned. We would hit the Overlook Restaurant and find my father and my son Luke waiting for us just a few minutes before our predicted 3pm pickup. The legs were tired and worked to be sure, but we also felt we still had more in us if we had wanted more. 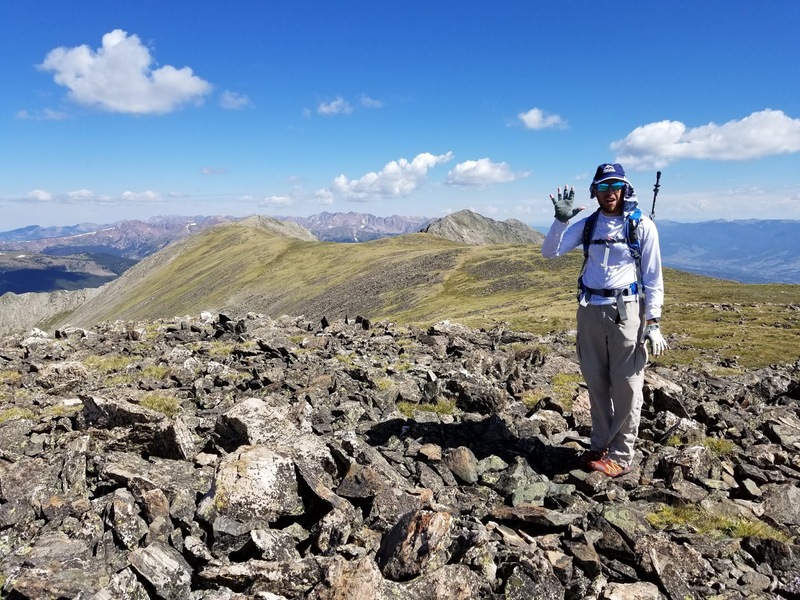 We found the Tenmile Traverse to be a truly epic adventure with an amazing combination of rock scrambling and exposure as well as the endurance component of hiking 17 miles with almost 8000 feet of elevation gaining 10 different mountain peaks. Down into the ski resort we go. Looks so different in summer. 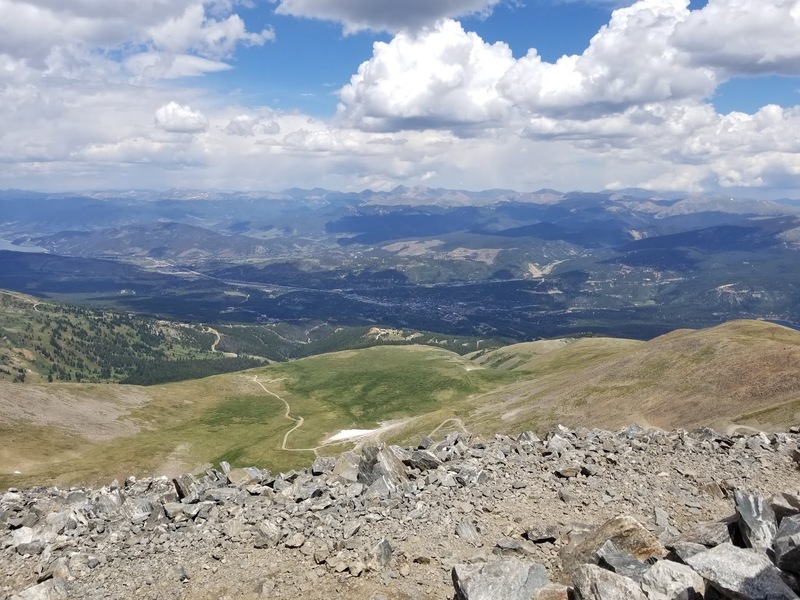 This is the cheap, free, way to enjoy Breckenridge.